Lex Peverelli’s site here is brilliant for identifying odd grenades and land mines. Again he has slowed down due to personal priorities but the site remains up. Since Lex is a UXO/UXB operator you can be sure he knows his stuff. Bruno has a great resource up here for German Flare Pistols. I learned a lot just reading through on the models I already have. The Commonwealth War Graves Commission site here is a useful lookup if you are trying to work out if your man made it through the two big wars of the last century. This is the German equivalent. If you are looking for a named German casualty who has ended up in a war cemetery use this link. Putting all of my accumulation up on the web took me three years and a lot of guilt driven attention to detail. I was helped by this great resource at www.picresize.com that enabled me to easily crop and resize the photos. This is the SHAEF G2 Basic handbook on the Hitler Jugend. It’s a terrible photocopy but that’s what the Government does best! 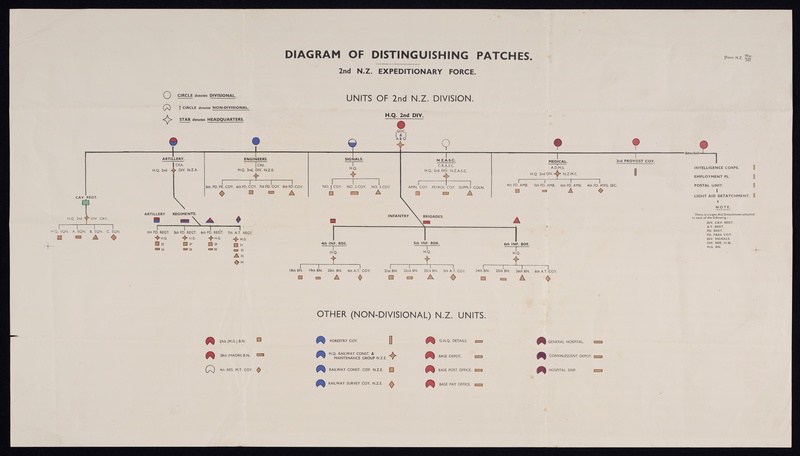 Here is the 2NZEF taxonomy of unit distinguishing patches for 2nd Division. Here is a dimensioned copy of the blueprints for the MP44 (StG-44).